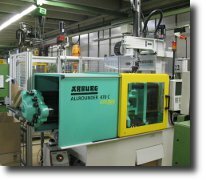 In our injection moulding production, we have 25 modern moulding machines by ARBURG, DEMAG and KRAUSS-MAFFEI at our plant in Ellwangen. 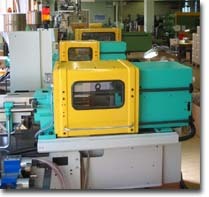 The machines have a locking pressure between 35 and 210 tons and a shot weight up to 600 grams. In the course of second operating we can offer additional treatments like hot stamping or tempo printing. Further treatments as drilling, turning, milling, ultrasonic welding or installation can also be done. We can do burst pressure tests for battery gaskets inhouse. In cooperation, tensile and pressure tests can be offered.